This app works on BOTH iPad and iPhone! 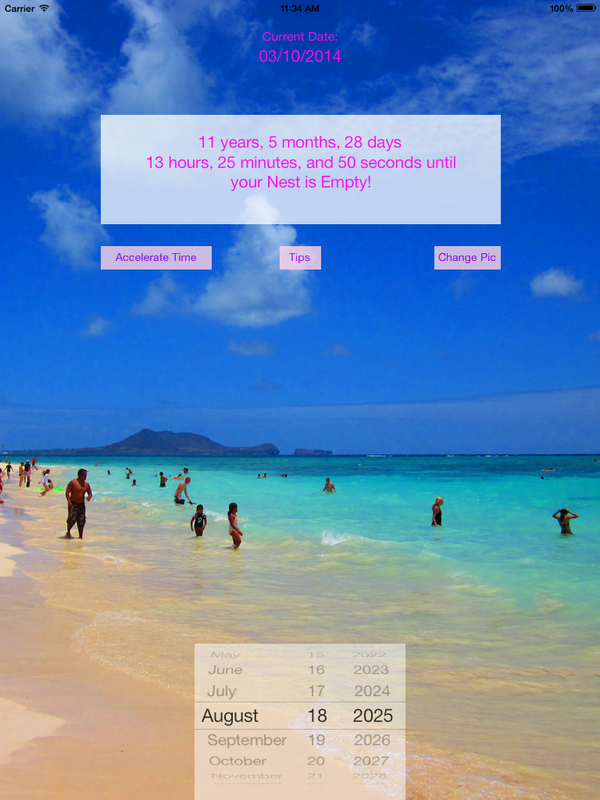 Above is the default user interface for the Empty Nest Calculator. This "universal" version is for iPad AND iPhone! But every so often, don't you wonder about how long it will be before they are out of the house? Off to college? Joining the Peace Corp? Just how long will it be until you enjoy your "Empty Nest?" Of course you do. . . it's only natural! This handy app lets you put in the Month, Date, and Year that your little darling, (or darlings), will get on that flight to Harvard! It then calculates the number of years, months, days, hours, minutes, and SECONDS until they leave! You can watch as the seconds slowly tick by. 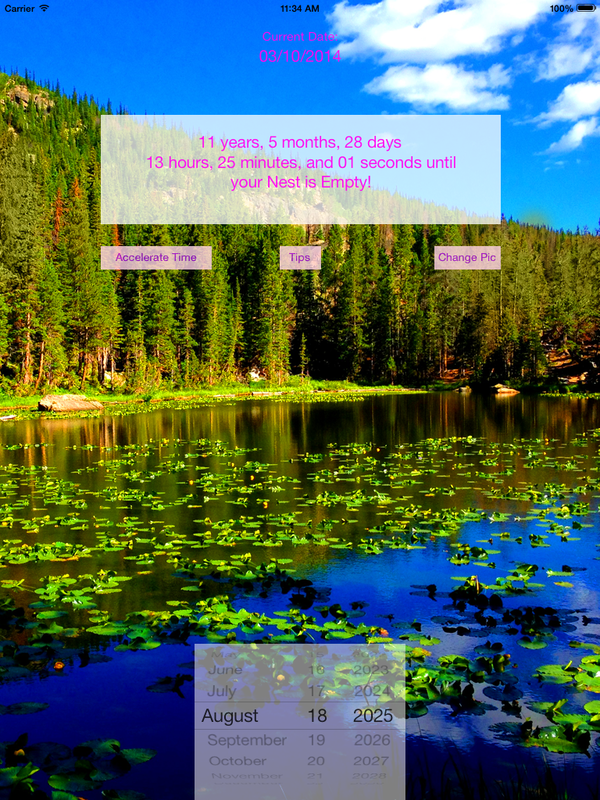 . . counting down the time until you have your soothing, quiet, Empty Nest. Too long to wait? Getting impatient? 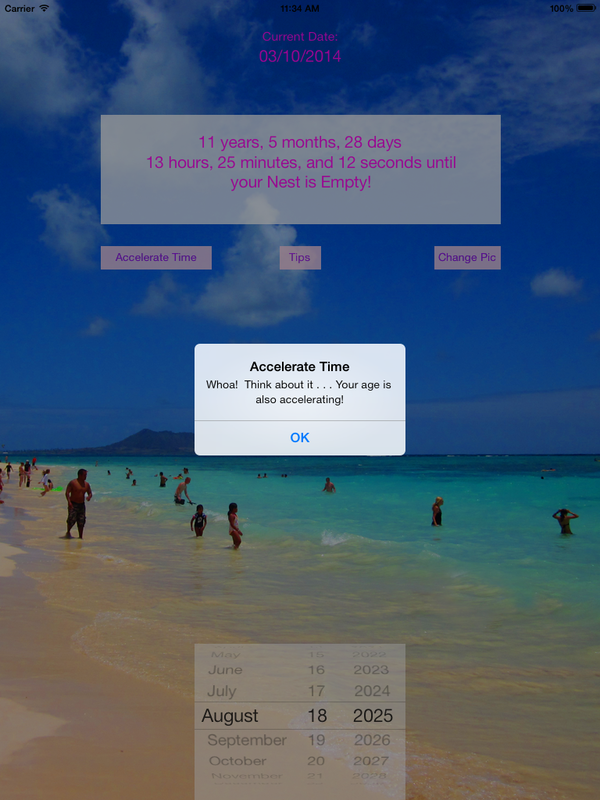 Click the "Accelerate Time" button and see what happens! 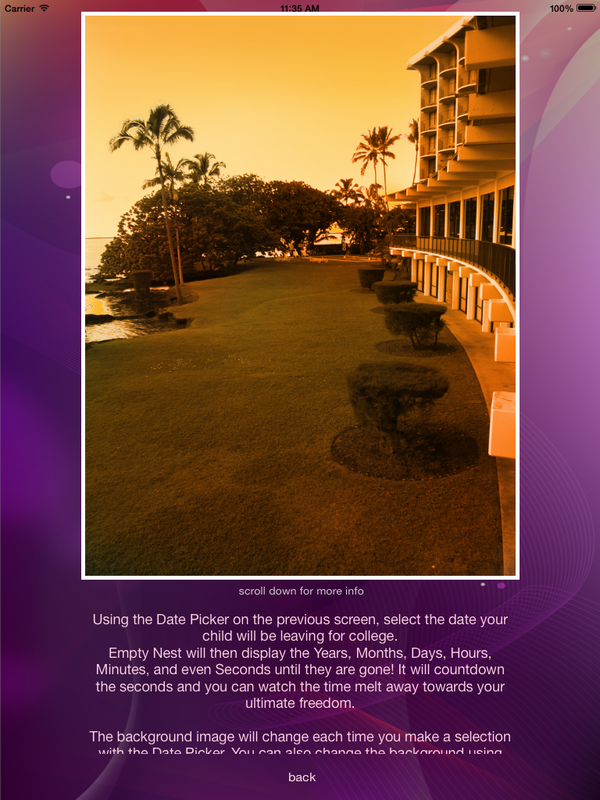 As you change the date, the background image fades from one gorgeous Empty Nest destination to another. You can also change the background image with the click of a button. This app is for fun and entertainment, and is guaranteed INACCURATE to within a few days! Get this fun app now and start dreaming! A great conversation starter in any situation. Fun to use while waiting on your order in the local drive-thru while your kids are driving you nuts! HA! 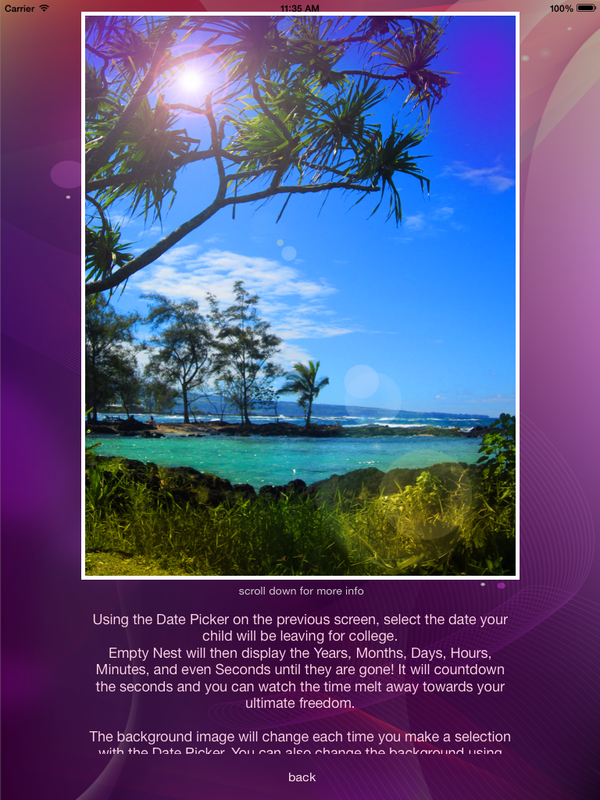 If you are experiencing problems with Empty Nest Calculator, try deleting it from your phone and re-installing. You can either sync your iPhone with your computer to reinstall Empty Nest Calculator, (if you have run a sync with your phone with your computer AFTER installing Empty Nest Calculator the first time), or download it again from iTunes or the App Store. You won't need to pay again, as iTunes and the App Store will remember you have previously installed it. Another dreamy destination when you finally get your Empty Nest! You can start planning now! Click the "Accelerate Time" feature to get a second opinion! A quiet mountain lake. Nice and peaceful. drench the private balconies of your first Empty Nest getaway! on the "Tips" page of the app.